The design process starts with a sketch or idea. A wax model or CAD design is then created. The diamonds or gemstones are set and the jewelry is polished. Then you’re allowed to fall in love with the finished product. The most common custom pieces are engagement rings and mother’s rings. In a few days, we can prepare an official jewelry appraisal document to insure your treasured items. We clean and polish the jewlery and provide a detailed description, as well as a replacement value. We suggest anything that was purchased over $500.00 should be insured. We offer full-service jewelry repair on sterling silver, gold and platinum. 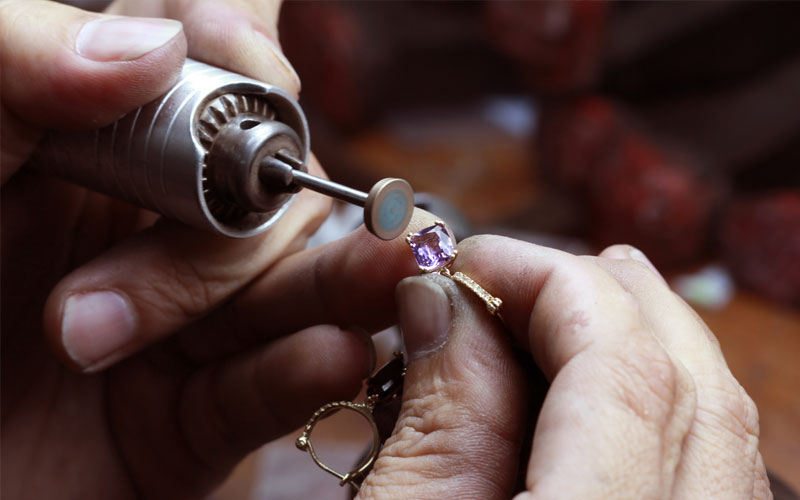 Repair services include ring sizing, stone setting, chain repair, retipping, rhodium plating, pearl re-stringing and more. We also change watch batteries and adjust watch bands. Call or stop in with questions or price inquires. Our sales floor offers a no-pressure, relaxed atmosphere and inventory including hundreds of engagement styles, diamond earrings and pendants, gemstone jewelry, Seiko watches, men’s jewelry, family jewelry and a large selection of sterling silver pieces. Cut- the most commonly used Round Brilliant Cut, the Princess Cut, the Marquise, the Cushion and even fantasy cut Diamonds you can find here. Color- Diamonds come in a wide range of colors, and we rate their color on a scale from D, or colorless to Z, a yellow Diamond. They also come in all types of rainbow colors, both natural and treated. Clarity- an "FL" Diamond is internally flawless, and an "I3" is considered imperfect, you can get a Diamond anywhere between the two. Carat weight- if you want a 3.00 ct. center, we’d be happy to get it in and set it for you. We deal in all sizes or "carats" of Diamonds. There is a 5th C as well, Communication. When you come in the store, we will go above and beyond to find you the Diamond you are looking for. Communication is essential as well with your partner in life, and the one that will receive the beautiful Diamond. Selling gold has never been easier. Gold has been going through the roof recently and now has never been a better time to sell your gold, silver or platinum. We buy gold necklaces, rings, bracelets, pendants, charms, chains and pretty much anything that has gold in it. We also buy Platinum and Silver. Fiscus Diamond pays top dollar for your unwanted gold.